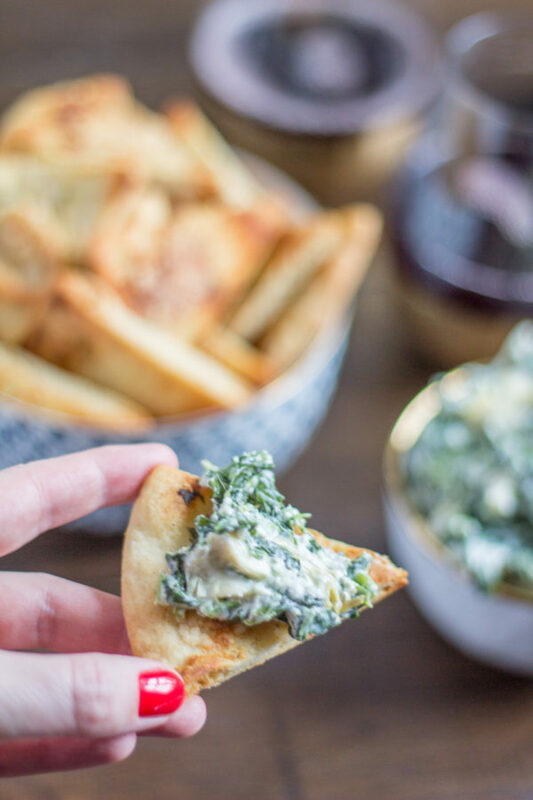 A healthy twist on a classic recipe, this Reduced Fat Spinach Artichoke Dip is irresistibly delicious. 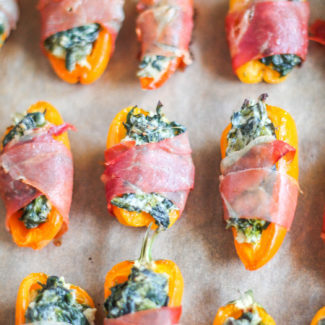 The best part is that you can prepare this easy appetizer in less than 10 minutes. 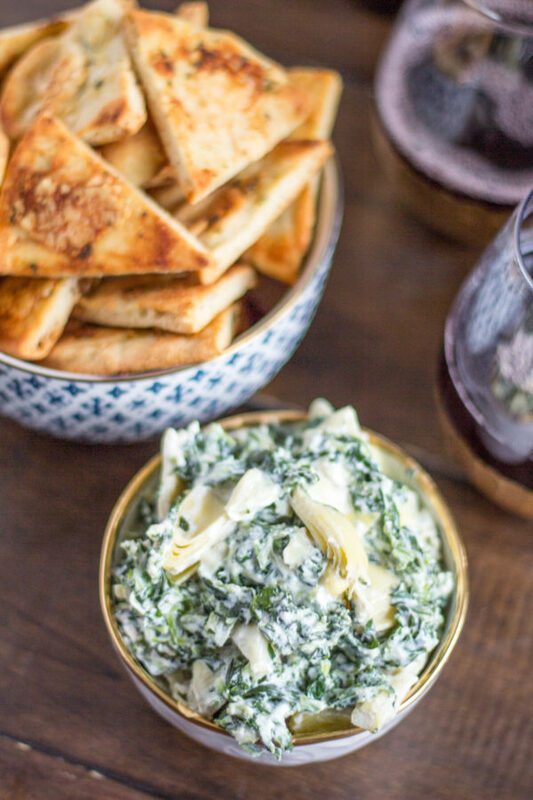 Spinach and artichoke dip is a classic. It is something that everyone seems to love, and it is easy to prepare. It seems to find it’s way into the menu at every party, right along side hummus. 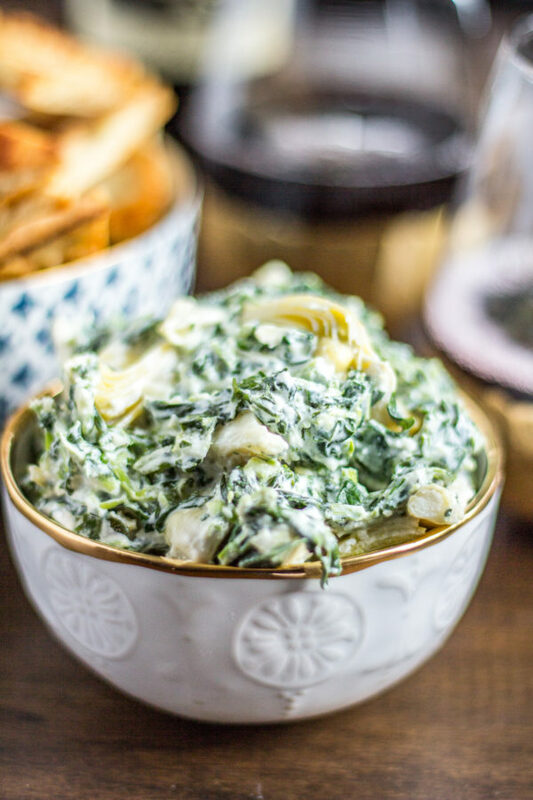 This Reduced Fat Spinach and Artichoke Dip is great with pita chips, and I have been known to add it to omelets and sandwiches. You can even use it to stuff a chicken breast! This is one of my favorite appetizers, I just can’t stop eating it, and I have been making it for years. 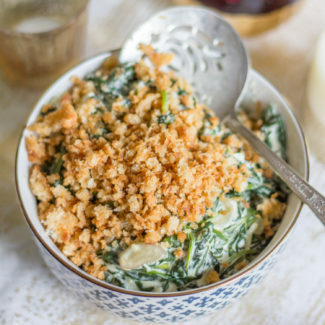 Reduced Fat Spinach Artichoke Dip replaces the mayonnaise that is typically in spinach artichoke dip with greek yogurt and reduced fat cream cheese. 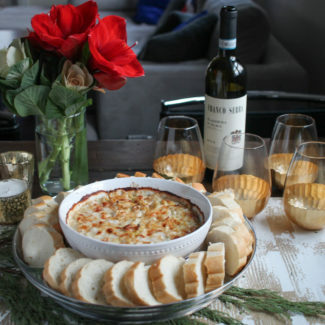 The dip still has the creaminess and cheesy taste, it just isn’t as heavy as other dips. This dip comes together in less than 10 minutes, and you can prepare it in advance and then reheat it. The only steps to preparing this dip are some chopping and then slowly combining ingredients and heating them in a skillet. Anyone can make this. 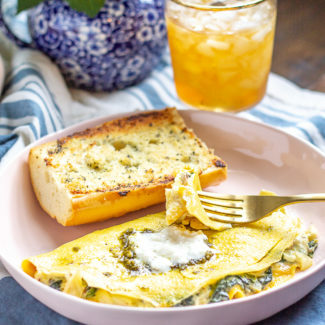 I like the ease of using frozen spinach, but you could use fresh spinach instead. 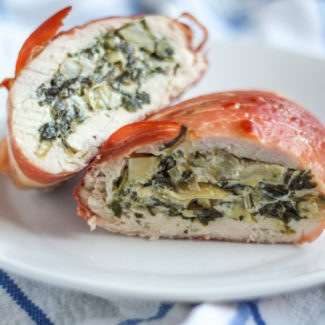 Just remember that fresh spinach greatly reduces in size when it is cooked so you will need a lot of it. I served the Reduced Fat Spinach Artichoke Dip with homemade parmesan garlic pita chips… and some carrot and celery sticks. 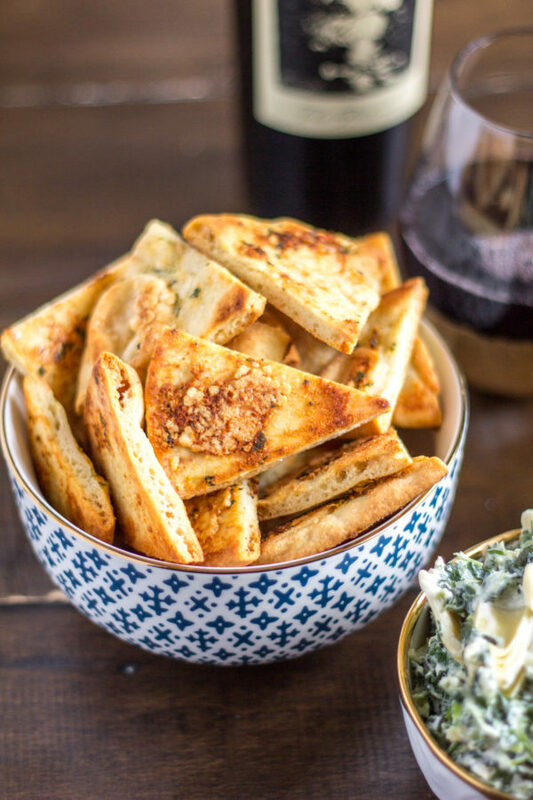 Because if you are going to make a healthy dip, you should probably serve it with something healthy and not just pita chips that were made with butter and cheese. Right? 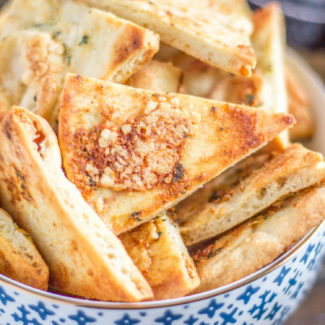 The recipe for the homemade parmesan garlic pita chips will be coming your way in a separate blog post tomorrow. Heat the butter in a skillet over medium heat. Use a garlic press to crush the garlic, and then sauté it in the oil for 1 minute. Then add the spinach. Sauté until hot, about 3 minutes. Lastly, loosely chop the artichokes and add them to the dip. Once hot, serve the dip. Or you can refrigerate the dip and reheat it in a skillet just before serving. 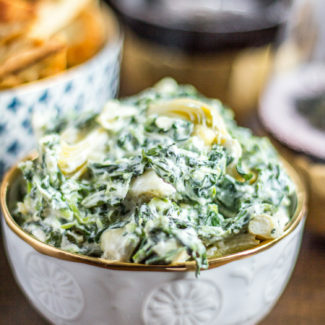 This Reduced Fat Spinach and Artichoke Dip is great with pita chips, and I have been known to add it to omelets and sandwiches. You can even use it to stuff a chicken breast!